After graduating from Yale University, Tracy Kelleher spent the next few years working in Italy. She returned to the United States to study medieval history in graduate school at Cornell University, but decided that academic life was not for her. She migrated to the Big Apple, where she worked at an advertising agency. Fast-forward through marriage, two children, one dog, and freelance writing for newspapers and magazines. 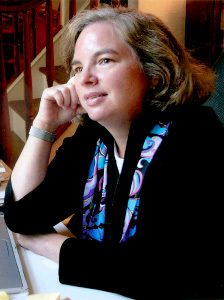 After her children entered school, she became a staff newspaper reporter and later the communications director for a non-profit organization that mediated disputes in Central and Eastern Europe. Eventually she returned to publishing as a magazine editor. Tracy sold her first romance to Kensington while she was a reporter and finally quit her day job after she found a home writing at Harlequin. Tracy values the flexible lifestyle that writing affords her. She has carried her laptop across three continents and swears that having to write in places such as Australia and Southern France has not hindered her ability to focus on her work. She currently lives in New Jersey and is hard at work on her next novel.